Catherine the Chameleon: some of the wildly different faces of Catherine Parr. Perhaps she was just hard to capture in paint. I would love to know on what basis Weir has identified the “new” portrait of Katherine Parr. No other actual historian or biographer of Parr has agreed with her findings and the portrait is not officially recognized. 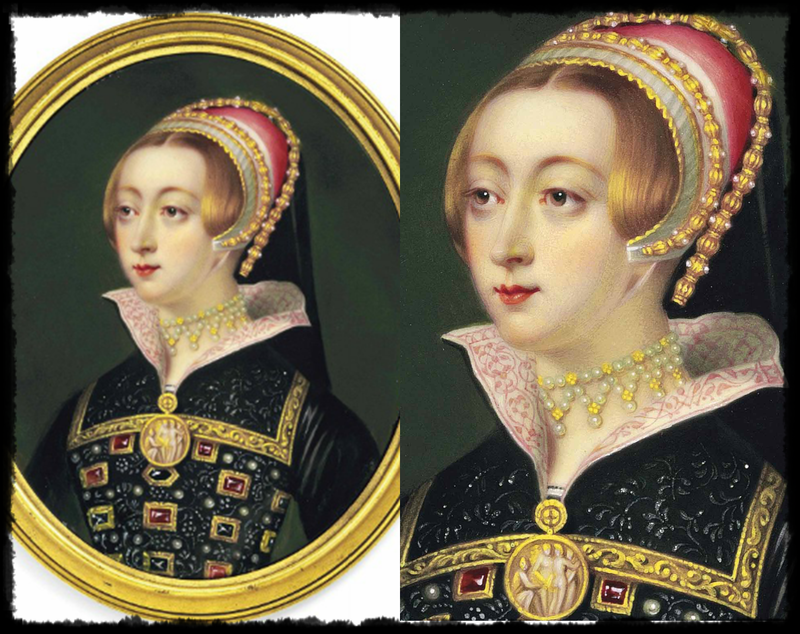 First off–the one on the bottom right is reported to be done by Holbein, the younger c.1542 (before the marriage of Queen Katherine in 1543). The one of the top right was done posthumously and has been officially identified by Katherine’s biographer Susan James. That portrait was done after her death (d.1548). The two on the left were done during Parr’s time as Queen. Although the two on the left look at tad different as the blogger states (David) — during studies done on the full length portrait done c.1545 show that the face, among other parts of the portrait, were altered. An x-ray study shows this below. 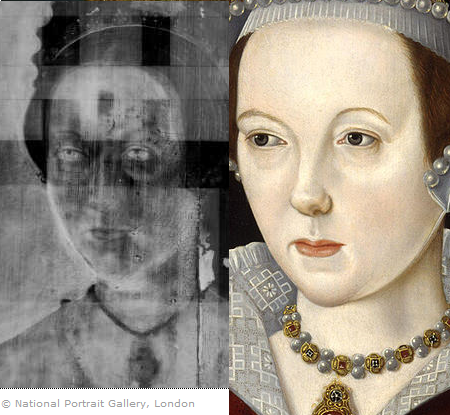 X-ray comparison of NPG portrait of Queen Katherine Parr by Master John compared to the queen’s portrait attributed to Scrots (right). The two without altering do look very similar. Weir, who is no expert on Parr, has more than a few errors in Parr’s section of her book, “The Six Wives.” While I applaud her efforts at writing, I do not use her for a reference and neither do most scholarly authors/historians. 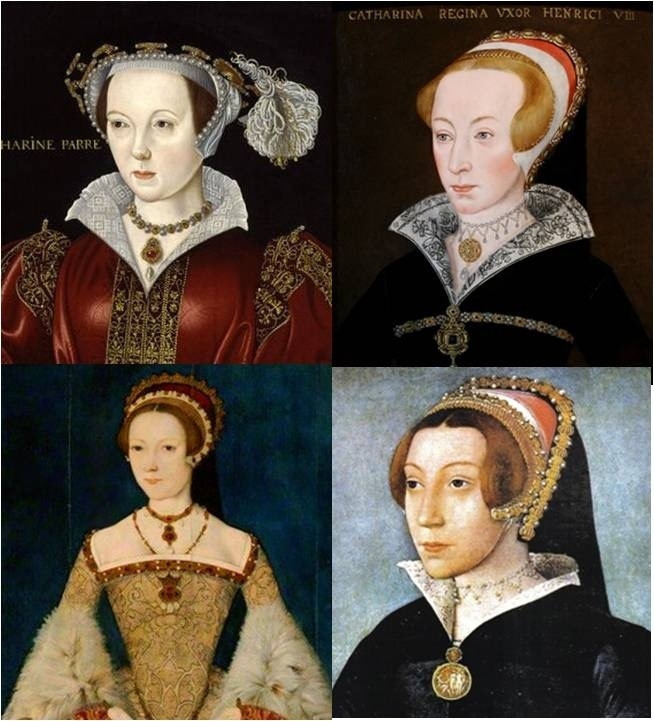 Weir states: “actually it’s a carcanet, or choker, and it’s very distinctive, and in fact unique in Tudor portraits of this period – is identical to the one in the portrait said to be Elizabeth (above, right). It’s almost certainly the same one, and fits a description of a carcanet listed in the Queen’s inventory.” To which I ask… which inventory of Queen Katherine? The inventory listed in Janel Mueller’s compilation of Katherine Parr’s works and correspondences has no mention of the carcanet. “A Lady called Anne Boleyn,” Henry Bone Pierce, Royal Collection. For 300 years, it was owned by her cousin, Sir Lionel Duckett, and his family. In 1832, it was put on sale in London with the rest of Sir George Duckett’s collection, and sold to Sir Joseph Neeld of Grittleton House near Chippenham Wiltshire. In 1851, it was described in the Grittleton catalogue as ‘the portrait of Queen Anne Boleyn’. It follows that Katherine Parr’s cousin would own a portrait of her. No doubt he was proud to display one of his kinswoman as queen. “Lady called Anne Boleyn,” Christie’s Auction. However, anyone who knows anything about Queen Katherine knows that her mother and the wife of Sir Thomas Parr was Maud Green, daughter of Joan Fogge. Looking back into the genealogy of Queen Katherine, modern genealogy amateurs state there is apparently a connection to Lionel Duckett. It is not clear, though. I looked into it and found a RootsWeb tree that connects an Eleanor Harrington to a daughter of Sir Thomas Parr of Kendal and Alice Tunstall who apparently married a William Harrington. Looking into the sources, The Duckett line from ‘Pedigrees Recorded at the Heralds’ visitations of the counties of Cumberland and Westmorland’, does not spell out who Eleanor’s mother is. It simply says “daug. of Wm. Harrington, of Wresham, in co. Lane”. The lineage also names only two sons of Eleanor–Richard and Robert. No William Duckett is listed; father of Lionel. In the lineage listed for Harrington in the same book, the pedigree lists that William Harrington of Wreysham married to “…dau. and co-heir of … Parr”. This again, leaves us with no solid evidence. Looking into Burke’s ‘A Genealogical and Heraldic Dictionary of the Peerage and Baronetage of the United Kingdom’, the Duckett line quotes an Eleanor Harrington, ‘dau of William Harrington, who had considerable possessions both in Lancashire and the barony of Kendal’. No mother listed. As I look through Douglas Richardson’s ‘Plantagenet Ancestry’, 2nd edition, there is indeed a daughter named Eleanor as the child of Thomas and Alice. Eleanor is listed as marrying Sir Henry Agard. Another daughter, Anne, is listed as the wife of William Harrington. However, it ends there with no documentation to further the connection between Duckett and Harrington. It seems to be a big mess that has yet to be figured out. 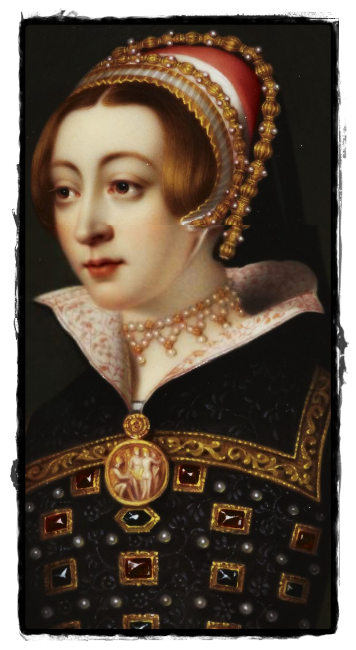 Lionel married a Mary Leighton — if I’m not mistaken, the Leighton family was connected directly and indirectly to the Boleyn’s via Mary Boleyn’s descendants. Yes, Mary Leighton’s uncle Sir Thomas Leighton married Elizabeth Knollys (granddaughter of Mary Boleyn, sister of Queen Anne). So Weir’s whole thing about them claiming it is Anne Boleyn..[which she doesn’t agree with] would make MORE sense! Alison Weir’s website with the two portraits “she found” of Katherine Parr (2012). So nice try, but until her biographers and other art specialists agree–the portrait, bottom right, is NOT a portrait of Katherine. Weir should really stick to writing and leave portraiture to the experts! H. C. Staley, Hélène Andorre Hinson Staley. “Paper and Stone: A Leighton History In England and the United States,” Xlibris Corporation, Apr 4, 2011. pg 458. William Betham (rev.). “The baronetage of England, or, The history of the English baronets, and such baronets of Scotland, as are of English families,” 1803. pg 98. This entry was posted in Reviews of Media: Queen Katherine Parr and tagged Alison Weir, catherine parr, katherine parr, New portrait, Portraiture, Tudo, Tudor portraits by tudorqueen6. Bookmark the permalink. Pleased you mention a Duckett who migrated to Maryland. I think he was Richard who married Charity Jacob, her sister Elizabeth Jacob married Mareen Duvall the Younger. It is possible that Mareen and Elizabeth were direct ancestors ( about 11 generations back) to President Obama. Some people are of the opinion that Richard Duckett was related to Sir Lionel Duckett, others suggest there is no evidence to back that up. All wheels within in wheels – how fascinating. I know exactly who you are talking about! I had no idea the Duvall family entered into the picture! They are direct ancestors of Obama. At least I’ve seen the lineage. I’m only seeing this Duckett in Maryland for the very first time! So it would be interesting to look into that lineage as well. Thank you! It appears from your fresh research that you have found an Eleanor Parr a daughter of Thomas and Alice Parr, who indeed seems to have married Henry Agard. It was her sister Anne who married William Harrington and they had a daughter born about 1447 called Eleanor probably named after her aunt. It was this Eleanor (Harrington) who married Richard Duckett. They had many children including William the father of Sir Lionel Duckett, also Anne who married Thomas Washington- same family that George Washington had in his ancestry. Douglas Richardson documents an Anne Parr who married a William Harrington, Yes. Then I went to other sources listed to figure out the puzzle. I stopped after finding Lionel. It seems that the Duckett family made it over to the US, stopping in Maryland. Interesting! Thanks for the tips! I may have to do an article on the possible Parr/Washington connection! Sir Kevin Parr Baronet says Alison Weir knows far more than the nest of eggs around her . Big opinions but no bloodlines or education to be able to comment both are needed. Excuse me? I’m not sure I understand. I finally looked into this theory. I rewrote my section on a possible Duckett connection to the Parr family. It’s rather messy and has yet to be figured out as documentation is lacking and/or missing to prove that either an Eleanor or Anne married a Duckett. I may continue to look into this, but as of right now–the only documentation of that link came from a website by an amateur genealogist. I went through each source listed and what I found is stated in the new section of this article. Reference to Sir Lionel Duckett and his connection to the Parr family. Sir Lionel was the son of William Duckett,the son of Richard Duckett who married Eleanor Harrington..
Eleanor was the daughter of William Harrington and Anne Parr. William and Anne were therefore great grand parents of Katherine Parr and Lionel Duckett, making them second cousins. I’m not sure what the reference is here. Are you claiming that Katherine Parr’s great-grandparents were William Harrington and Anne Parr? That information is not correct. Katherine descended from the male line of Parrs, not a female. Very nice to see you referenced “Paper & Stone, A Leighton History in England & the United States.” Best wishes to you. Smiles from Helene Staley.